A groundbreaking new study documenting light pollution across the globe finds that more than 80 percent of the world’s population lives under light polluted skies. The United States and Europe have it even worse, with 99 percent of their denizens experiencing skyglow at night. The new “World Atlas of Artificial Night Sky Brightness,” published in the open access journal Science Advances, is a welcome follow up to the 2001 “World Atlas” and is sure to benefit researchers across multiple disciplines. The atlas documents a world that is in many places awash with light. In Western Europe, only a few small areas remain where the night sky remains relatively unpolluted, including areas in Scotland, Sweden, Norway, and parts of Spain and Austria. In addition to a world map, researchers provide tables of each country and what fraction of its population live under highly light polluted skies. The authors specifically examined the G20 countries, finding that in terms of area, Italy and South Korea are the most polluted, and Canada and Australia the least. Residents of India and Germany are most likely to be able to see the Milky Way from their home, while those in Saudi Arabia and South Korea are least likely. According to the study, street lighting and outdoor lighting retrofits using 4000K lamps (IDA recommends 3000K or below) could result in a 2.5 increase in light pollution. This is because sources with higher color temperatures are more polluting. The researchers warn that that unless blue-light emissions are restricted, the transition to LED technology is only going to exacerbate the problem (See the IDA LED Practical Guide). To decrease light pollution, the authors prescribe full shielding of lighting, using the minimum light needed for the tasks, shutting off or lowering light levels when not in use, decreasing the total installed flux and limiting “blue” light (light with higher color temperatures). Major advances over the 2001 atlas were possible thanks to a new satellite and to the recent development of inexpensive sky radiance meters. 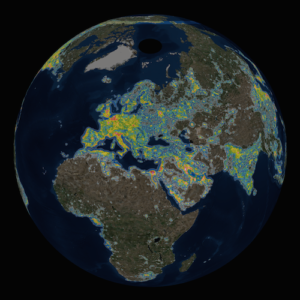 City lighting information for the atlas came from the American Suomi NPP satellite, which includes the first instrument intentionally designed to make accurate observations of urban lights from space. The atlas was calibrated using data from “Sky Quality Meters” at 20,865 individual locations around the world. Engagement of citizen scientists, including those participating in Globe at Night, in collecting the calibration data was critical, according to Dr. Christopher Kyba, a study co-author and researcher at the GFZ German Research Centre for Geosciences. “Citizen scientists provided about 20 percent of the total data used for the calibration, and without them we would not have had calibration data from countries outside of Europe and North America,” Kyba said. Researchers from Italy, Germany, the USA, and Israel carried out the work, which was led by Fabio Falchi from the Italian Light Pollution Science and Technology Institute. The authors of the paper are affiliated with the following institutions: Light Pollution Science and Technology Institute, U.S. National Oceanic and Atmospheric Administration, US National Park Service, GFZ German Research Centre for Geosciences, and the University of Haifa. Access the free online version here.